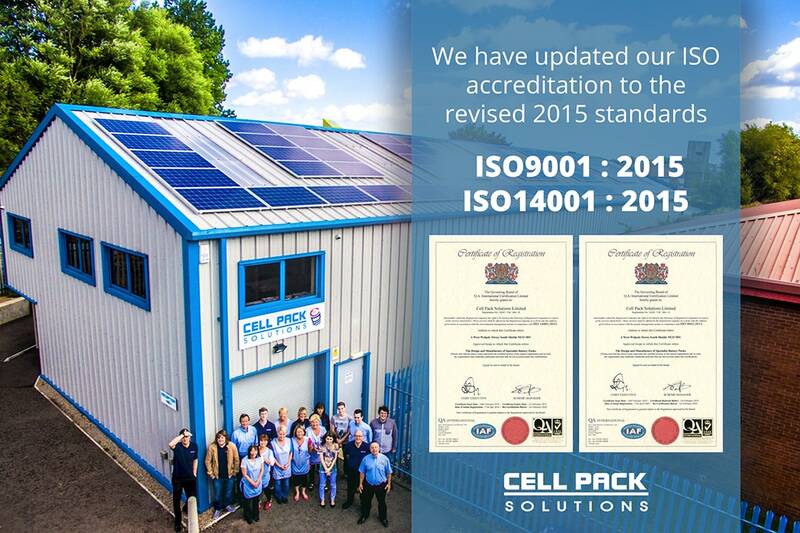 Cell Pack Solutions have maintained their ISO accreditation, meeting the revised ISO9001:2015 and ISO14001: 2015 standards. Cell Pack first attained the ISO 9001:2008 Quality Management System standard in May 2001. Once we realised the benefits of having a QMS standard, we thought it would also be beneficial to attain ISO 14001:2004 Environmental Management System (EMS) in July 2010. We update these standards annually, offering the best customer experience and minimising our footprint on the environment. ISO 9001 is one of the most widely used management standards in the world today. It is designed to help organizations ensure that they meet the needs of customers while meeting statutory and regulatory requirements related to a product or service. ISO 9001 is broken down into 7 Quality management standards (QMS) to help achieve this. They are as follows. QMP 1 – Customer focus – Should meet customer requirements and strive to exceed customer expectations. QMP 2 – Leadership – Maintain the internal environment in which people can become fully involved in achieving the organization’s objectives. QMP 3 – Engagement of people – The full involvement of people enables their abilities to be used for the organization’s benefit. QMP 4 – Process approach – A desired result is achieved more efficiently when activities and related resources are managed as a process. QMP 5 – Improvement – The organization’s overall performance should be a permanent objective of the organization. QMP 7 – Relationship management – suppliers, contractors, service providers are interdependent and a mutually beneficial relationship is achieved. The standard follows the PDCA system of Plan, Do, Check, Act. Following this cycle allows the highest QMS to be maintained and develop. ISO 14001 is a voluntary standard related to environmental management. It aims to help organizations minimize their negative effect on the environment. Ensuring that they comply with applicable laws, regulations, and other environmentally oriented requirements; and continually improve upon them. Cell Pack Solutions have always had a focus on maintaining as positive effect on the environment as we can. As a company we are always looking to improve, whether it be our facilities or working practice. We are delighted to continue our high standards, keeping in line with ISO accreditation. We are currently also working towards the introduction of the new GDPR laws, which will be introduced 25th May 2018.